Large dirigible airships graced the skies for nearly four decades, from the turn of the century to the late thirties. During that period they were extensively used for both transportation and as weapons of war. During "The Great War" Germany employed gigantic airships called Zeppelins as bombing platforms against Allied soldiers, as well as the civilian populations of France and Great Britain. In the silence of the night, these huge gas filled behemoths would unleash bombs from the sky on often unsuspecting civilians sleeping below. While not effecting massive destruction, they were useful as "terror weapons" and contributed to keeping the civilian populations off balance. Desperate to put an end to the attacks, Britain employed aircraft as "Balloon Busters," and after successfully shooting down several, put an end to the menacing raids. After WW I dirigible airships continued to have military applications, yet they also began to be used commercially. They made air travel across the Atlantic not only possible, but luxurious. With private staterooms and opulent dining rooms, travel by airship became as much the mark of the rich and famous as travel by luxury liner on the oceans. Once airship routes were tied in with regular commercial routes, air travel became increasingly appealing. Travel companies sold the idea of safe and fast airships as the most modern, and comfortable way to fly. During the thirties airships remained popular, yet several horrific disasters occurred that brought down their reign by the end of the decade. The U.S. Navy had a fleet of four airships. Yet the tragic crashes of three, the USS Akron, USS Shenandoah and USS Macon, with the loss of many lives, and all within a very short period of time due to bad weather, caused the Navy to abandon their use. Only the USS Los Angeles survived long enough to be de-commissioned and scrapped. The most well known airship disaster occurred in 1939 when the famous German dirigible Hindenburg exploded at Lakehurst, New Jersey while landing. It was suspected that the cause was a static electric spark that ignited the highly flammable hydrogen gas in her hull. The disaster brought an abrupt end to their use for commercial transportation. Today, we use small airships or "Blimps," filled with stable helium gas, to film sporting events and as advertising platforms. And the military has been toying with the idea of using small blimps for surveillance at our borders. The Museum's collection of artifacts from the more notable airships and dirigibles has grown substantially in the last few years. We have a large collection of ephemera located in our Archives. Our collection of travel posters contains several related to the Graff Zeppelin and the Hindenburg. We also have a unique collection of artifacts currently on display in an exhibit case located in the International Hall of Fame. These include a piece of aluminum from the USS Akron, pieces of framework from USS Macon and USS Shenandoah, vials of engine oil from the Graf Zeppelin, fabric from the dirigibles Hindenburg and Graff Zeppelin, as well as a Christmas ornament from the Graf Zeppelin. Also included are several original instruments, including a barometer that belonged to Count Von Zeppelin and pitch and bank indicators from a World War I attack Zeppelin. 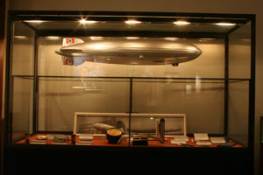 Also on display is a 1/400 model of the Hindenburg, built and donated by Henry Cord Meyer. currently there are no photos in this gallery.